Are you looking for Wasp Control in NJ? ALCO Animal & Pest Control offers prompt, professional and safe Wasp Control in NJ since 1995 for many satisfied clients. Whether it is residential or commercial Wasp Control , ALCO Animal & Pest Control will solve your Wasp problem in no time. Our trained and experienced NJ Wasp Control technicians are qualified to handle a variety of Wasp situations and can rest assure to restore your normal life, keep you, your children, or your employees safe and keep you in line with state and local animal laws. 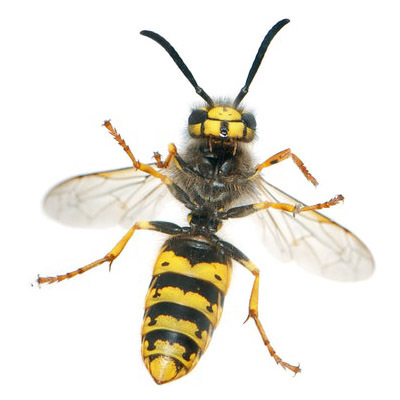 ALCO Animal & Pest Control uses environmentally friendly Wasp Control products as well as humane Wasp Control methods to keep you and your children safe while performing the Wasp Control job. Our knowledgeable pest technician will answer any questions you may have and explain to you every detail you need or want to know about the job. We are always friendly and we are here to help. Although wasps can be of use around the garden by consuming dead insects and eating flies they can be a nuisance too. Apart from stinging, their persistence can be irritating and present a threat to those allergic to their sting. Wasps are distinguishable from bees by their pointed lower abdomens and the narrow "waist," called a petiole, that separates the abdomen from the thorax. Unlike bees, wasps can sting repeatedly. All wasps build nests. Whereas bees secrete a waxy substance to construct their nests, wasps create their familiar papery abodes from wood fibers scraped with their hard mandibles and chewed into a pulp. Late in the summer, the queen of some species will produce unfertilized eggs. These will develop into males. The males will fertilize the wasps that will become the queens of the following year. These fertilized females will spend winter in a sheltered location. In most cases, the rest of the colony will perish when winter comes. Next spring, the queen will start laying eggs. The fertilized eggs that they produce will become workers, building the nest and feeding the larvae produced by the queen. Generally, wasps get in through openings that lead inside our homes and commercial buildings. Therefore, effectively sealing openings that may lead into a home is critical for wasp prevention. Wasps come into a home looking for a food source, a nesting site, a protected place in winter to hibernate or by accident. In addition, sealing access points inside your home will help prevent problems from many other pest insects and spiders. Creatures who haplessly stumble upon a wasp colony or disturb a nest will find themselves quickly swarmed. A social wasp in distress emits a pheromone that sends nearby colony members into a defensive, stinging frenzy. If a wasp nest is built inside, the resulting problem is an infestation that may become a serious stinging episode and perhaps an associated allergic reaction problem. Also, wasps that nest inside may damage the wallboard or ceiling. Another major problem associated with inside nests is the possibility of scavenger pests that infest abandoned inside wasp nests.